As the title says, Apple's newly released iPhone XS Max has the 'Best smartphone display' ever. According to a test made by DisplayMate, receiving the highest ever A+ grade and providing considerably better performance than competing smartphones. 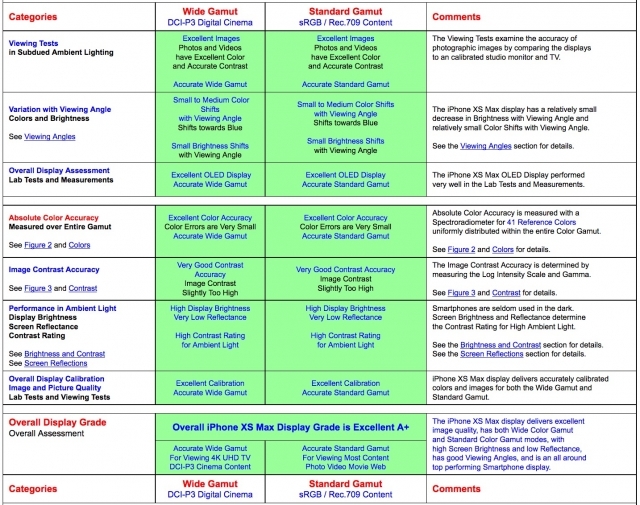 Apple has continued to raise the on-screen Absolute Picture Quality and Absolute Color Accuracy of their displays by implementing Precision Factory Display Calibration, moving the overall iPhone XS Max display performance up to Record Setting Outstanding levels, and setting many new Display Performance Records, including Absolute Color Accuracy at a very impressive 0.8 JNCD that is Visually Indistinguishable From Perfect, and almost certainly considerably better than your existing Smartphone, 4K UHD TV, Tablet, Laptop and computer monitor. The iPhone XS Max also has a Record High Full Screen Brightness for OLED Smartphones of 660 nits, considerably brighter than most OLED and LCD Smartphones. What do you think about the iPhone XS Max Display?